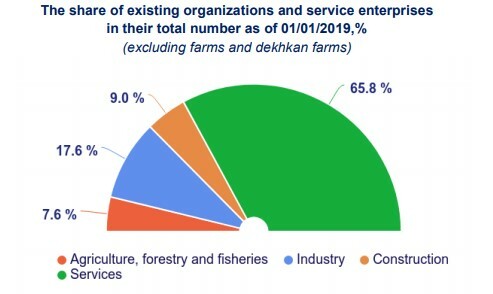 According to the State Statistics Committee, as of January 1, 2019, out of 323.5 thousand active organizations and enterprises, about 213 thousand were involved in the service sector. 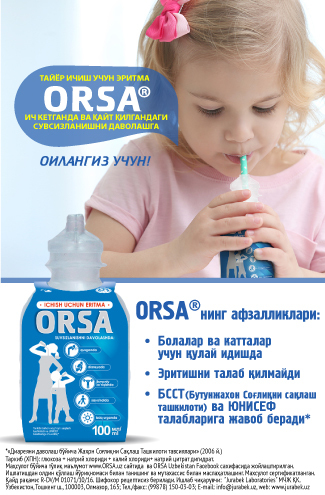 Of the total number of organizations and enterprises providing services, over 153 thousand are small businesses. As of January 1, 2019, their share was 72.2%. 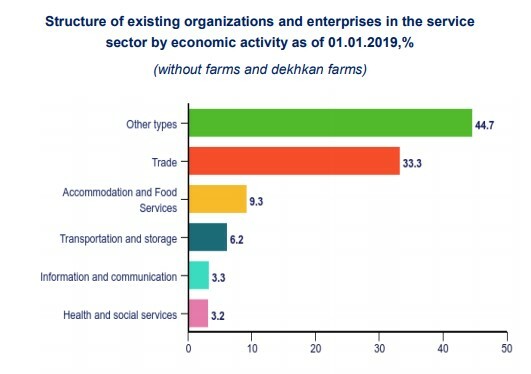 The share of institutions engaged in trading activities (33.3%) prevails in the structure of existing organizations and enterprises in the service sector. The development of partnerships between the countries of near and far abroad, as well as the tourism industry has an impact on the increase in the number of existing organizations and enterprises providing services for accommodation and meals. For information, as of January 1, 2018, 191.2 thousand organization and enterprises were involved in the service sector. In their overall structure, the largest share was occupied by trade services (33.0%), accommodation and meals (9.0%), transportation and storage (6.3%), information and communication (3.3%), health care and social services (3.1%).